I or after the last card. because the two numbers correspond. Biblical statement I Am the Alpha and the Omega. and his tools on the table in front of him. wondrous halo, adorned with roses. Roses symbolise divine love and perfection. human being, or the Self or Divine Soul. which the self receives upon a sacrifice. Through the cross to the Rose. the Christ. I will explain more on this later in the deck. emotional, mental and spiritual aspects of ourselves. world and make it a reality. to focus and concentrate the mind. has been brought into alignment with the Higher Will. heart is the seat of Vision as well as the Christ within. of the artist and creator. until it can see in the mirror clearly. for others to become aware of. to become the Magician as your first step. physical. The Magician has the power to work miracles. of mankind and he worked miracles. work miracles and to liberate minds! 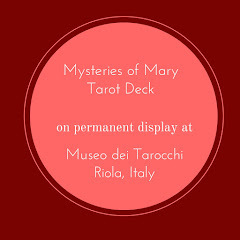 The Mysteries of Mary Tarot Deck, 78 Sacred Altars published as a deck of cards; a life of the SacredOrdinary. 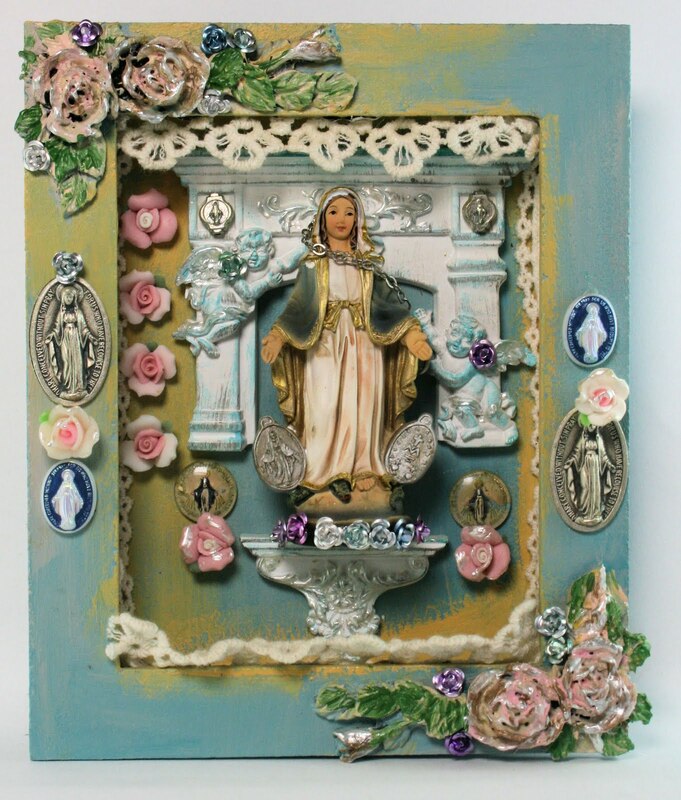 Each card is an individual shrine dedicated to an archetype, an initiation, a Mystery in the Great Mystery and a vignette of one of the stories woven into this tapestry of Mary. When you read them together, one after the other, laid out in a sacred dance of meaning and insight, they become a garland of roses, a rosary of cards, creating a sacred Rose Garden. 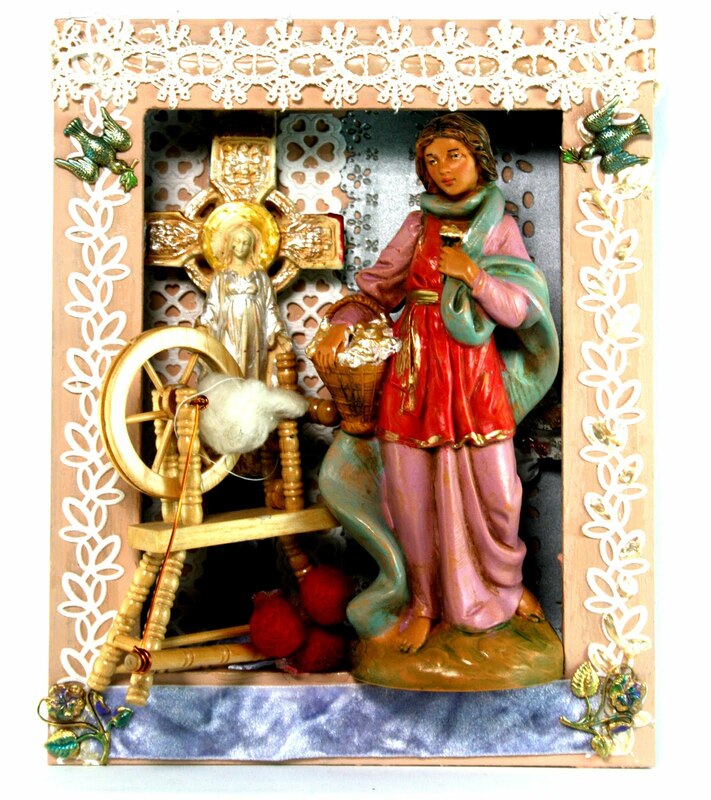 The Sacred Mysteries of Mary, the myth and the metaphor of the Madonna as a wisdom path, as reflected in the archetypal Book of Tarot. 78 Hand crafted shrines to be published as a deck of cards. Walking the four paths of Beauty, Compassion, Truth and Wisdom. 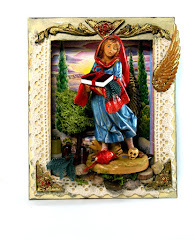 Each card is an individual shrine dedicated to an archetype, an initiation, a Mystery in the Great Mystery and a vignette of one of the stories woven into this tapestry of Mary. When you read them together, one after the other, laid out in a sacred dance of meaning and insight, they become a garland of roses, a rosary of cards, creating a sacred Rose Garden. Amazing, beautiful and mind boggling accurate. The deck is exquisite. The wisdom and journey in the book is heaven sent for those who listen. Thank you Hettienne for creating this gift. My beautiful deck arrived today. I'll leave a rating once I can (Etsy says I can on the 21st). I just wanted to let you know that your words and images move me to tears of a remembrance long forgotten. 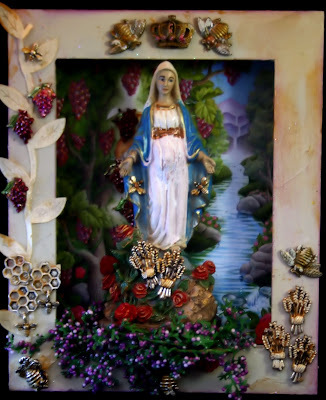 I'm very grateful that I "found" your images and stories of Our Lady. The cards arrived today. Thank you so much. 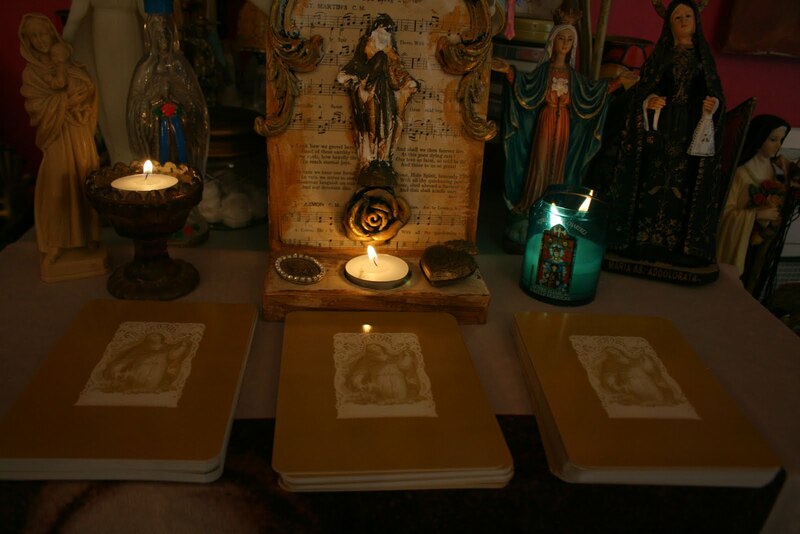 The cards and book are wonderful and they resonate deeply to me. I am thrilled with them, I knew I would be. 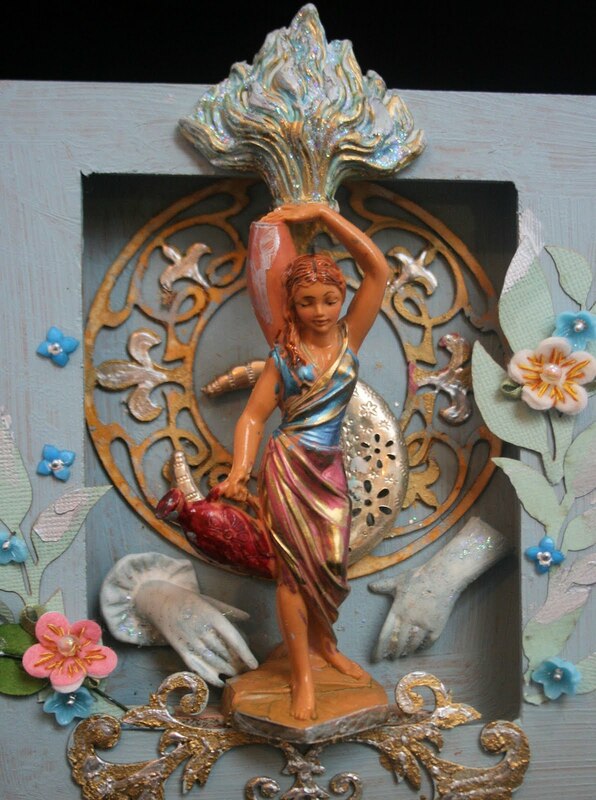 The Marian energy is so strong in all the things that you create. The gorgeous box and bag are so lovely, I am going to treasure them. Hello! Received the package today!! What a Beautiful deck and package! The book is very informative and beautiful. I feel closer to Her because of you. Good Morning, my dear Hettienne! I received my wonderful package. My daughter-in-law and myself were delighted as we unwrapped each intricate piece to get to the beloved card deck. You totally rocked my world with this lovely presentation. The book is simply divine. 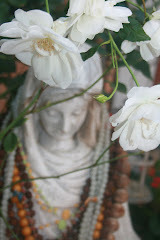 And even a rosary - I love saying rosary. Your divine creation has a permanent home in my heart. Thank you and I am sending you many blessings with love.